Courses like landscape ecology, remote sensing and GIS have the potential to attract a wide range of students because they are both visual and applied. Forestry and natural resource courses have a similar potential, particularly when they include field trips and active learning that place students in a natural environment. I find creative ways to make lectures, labs and field trips accessible to my students. 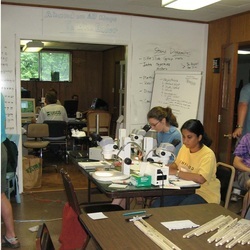 Data like tree-rings, being collected here, can teach students about forest response to stress and climate. Patterns in remote sensing imagery, like the defoliation (greenish tones) in this Landsat image, can help us quantify and understand how stresses spread across landscapes.